Sachin Ramesh Tendulkar is one of the greatest batsman in the cricket history. He is the first cricketer to score 200 runs in one day international cricket. Also he is the only person scored 100 international centuries in both one day and test matches. 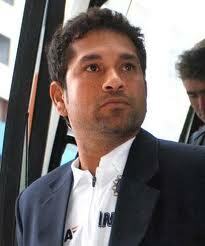 Sachin Tendulkar was born on April 24, 1973 in Mumbai, the capital of Indian state, Maharashtra. He completed his high school in Shradashram Vidyamandir, Mumbai. In his schooldays he trained in the MRF Pace Foundation as fast bowler, and later he focused on his batting as suggested by an Australian fast bowler. In 1988, Sachin Tendulkar scored 100* for Bombay against Gujarat in his first-class debut match. Then he scored centuries in debut matches of the Deodhar and Duleep Trophy, the Irani Trophy and the Ranji Trophy which get him into the Indian cricket team.